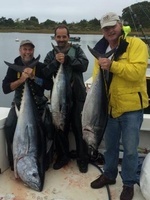 Experience incredible Bluefin Tuna and Striped Bass fishing on one of our custom fishing charters! Our boat is docked at a slip in Stage Harbor in Chatham with easy access to Cape Cod's best fishing spots for Bluefin Tuna and Striped Bass. Our boat, Shearwater, is a 36' BHM Downeast with a 13' beam which provides a comfortable, dry ride in all weather and sea conditions. The boat has plenty of room for taking up to 6 anglers on each trip. The boat holds ~350 gallons of fuel total with a range of over 400 miles. It has a 410 hp diesel engine which provides for a 16 knot cruising speed and a 20 knot top speed. The boat is totally equipped with top of the line tackle and safety equipment for successful fishing around Monomoy, in Nantucket Sound, and offshore east and southeast of Chatham.